The high water frothing through the Grand Valley this spring is a sharp contrast to conditions in June last year, when there was barely enough water to float a boat on the Colorado River between Palisade and the confluence with the Gunnison. The high water has brought hazardous floating conditions — be careful out there — and submerged some sections of the Colorado Riverfront Trail, but it has also brought smiles to the faces of kayakers, irrigators, and the folks in charge of efforts to recover four species of endangered fish that reside in these waters. And downstream, Lake Powell is rising at the rate of one foot per day, easing worries that the reservoir could soon drop below the level necessary to generate electricity at Glen Canyon Dam. The Colorado River at the gauge near Cameo in DeBeque Canyon crested at over 25,000 cubic feet per second (cfs) on June 2-3, and was still running well above average on June 10 at 16,400 cfs. It’s not advisable to brave these flows and associated floating debris on an air mattress, but with a proper boat, life jacket and an experienced guide, great adventures can be had. When the Cameo gauge surpasses 20,000 cfs, the “Big Sur” wave forms at the old Orchard Mesa Irrigation District diversion in the canyon, providing a legendary, if temporary, playground for kayakers and surfers. The last time the wave formed was in 2011, and the last time before that was rumored to be in 1997. It’s gone now, but if the warm “El Niño” currents in the Pacific Ocean bring us another wet winter it could be back next year. 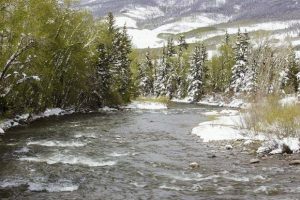 The high peak flows were partly a result of an unusually generous snowpack in the upper reaches of the Colorado Basin and partly a result of coordinated reservoir releases to improve habitat for endangered fish. These fish need to have the floodplain inundated periodically to create good spawning habitat. The Gunnison River at Whitewater, just upstream from Grand Junction, peaked at 12,900 cfs on June 6. The higher than average peak flows were largely due to higher than usual releases out of Blue Mesa and the other two dams in the Aspinall Unit. 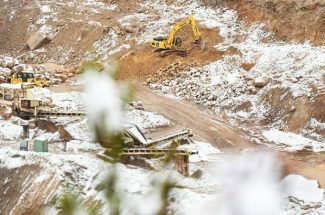 The Bureau of Reclamation delayed the high releases to avoid the flooding that could occur if both the Colorado and Gunnison rivers crested in Grand Junction at the same time. During peak releases from the Aspinall unit, all four gates on the Morrow Point dam, the middle dam in the trio, were opened for the first time since the record flood year of 1984. The high releases were made under a 2012 modification to the unit’s operating rules that increases release requirements in wet years to benefit endangered fish habitat. The peak flow at Whitewater was a bit below the 14,350 cfs target, but the Bureau of Reclamation will still try to attain the related goal of maintaining flows at Whitewater above 8,070 cfs for 40 consecutive days. Flows first hit this target on May 30. Gunnison River flows at Whitewater were still at 10,900 cfs on June 10. While we play in our rivers and local irrigators enjoy a respite from worries about shortages, the Southwest as a whole remains in a precarious water position. Downstream, almost the entire Colorado River Basin remains in moderate to extreme drought.